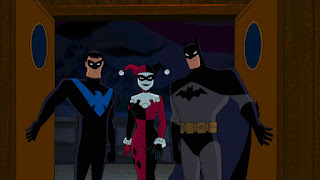 DENVER--(BUSINESS WIRE)--Following successful big screen presentations of “Batman: The Killing Joke” and “Batman: Return of the Caped Crusaders” in 2016, Warner Bros. Studios, DC Entertainment and Fathom Events are proud to announce a special, one-night cinema event for the latest DC Universe Original Movie, “Batman and Harley Quinn,” on August 14, 2017 in movie theaters nationwide. One night prior to the Digital release and 15 days in advance of its arrival on Blu-ray™ and DVD, “Batman and Harley Quinn” will screen Monday, August 14, 2017 at 7:30 p.m. local time. In addition to seeing the film, audiences at the one-night screening will be the first to experience an exclusive featurette spotlighting the film’s star character, Harley Quinn. Tickets for “Batman and Harley Quinn” can be purchased beginning Friday, June 30, 2017 online by visiting www.FathomEvents.com or at participating theater box offices. Fans throughout the U.S. will be able to enjoy the event in select movie theaters through Fathom’s Digital Broadcast Network (DBN). A complete list of theater locations will be available June 30 on the Fathom Events website (theaters and participants are subject to change). Produced by Warner Bros. Animation from an original story spawned by animation icon Bruce Timm, “Batman and Harley Quinn” finds Poison Ivy and Jason Woodrue (a.k.a. The Floronic Man) embarking on an ecological quest to save the planet – and, unfortunately, eliminate most of humankind along the way. To save humanity, Batman and Nightwing are forced to enlist Harley Quinn to catch Poison Ivy, Harley’s BFF and frequent partner-in-crime. Batman’s patience is put to the test by the unpredictable and untrustworthy Harley, as the reluctant companions face twists and turns during their bumpy road trip. The result is a thrill ride of action, adventure and comedy no Batman fan has seen before. The film boasts a stellar voice cast topped by The Big Bang Theory star Melissa Rauch in her first turn as the irrepressible Harley Quinn. 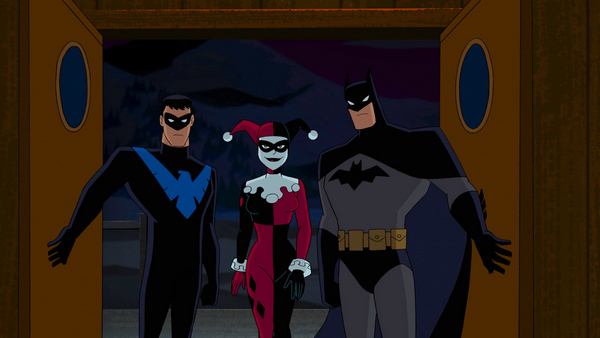 The fan favorite voices of Batman: The Animated Series – Kevin Conroy as Batman, Loren Lester as Nightwing – take the protagonist leads, while Paget Brewster (Criminal Minds) and Kevin Michael Richardson (The Cleveland Show) provide the voices of the villainous duo of Poison Ivy & Jason Woodrue, respectively. Sam Liu (Batman: The Killing Joke) directed the film from an original story by Bruce Timm (Batman: The Dark Knight Returns) with a teleplay written by Timm & Jim Krieg (Justice League: The Flashpoint Paradox). Co-Producer is Alan Burnett (The Batman). Executive Producers are Sam Register and Bruce Timm. Benjamin Melniker and Michael Uslan are Executive Producers. Fathom Events is recognized as the leading domestic distributor of event cinema with participating affiliate theaters in all 100 of the top Designated Market Areas®, and ranks as one of the largest overall distributors of content to movie theaters. Owned by AMC Entertainment Inc. (NYSE: AMC), Cinemark Holdings, Inc. (NYSE: CNK) and Regal Entertainment Group (NYSE: RGC) (known collectively as AC JV, LLC), Fathom Events offers a variety of one-of-a-kind entertainment events such as live, high-definition performances of the Metropolitan Opera, dance and theatre productions like the Bolshoi Ballet and National Theatre Live, sporting events like “Canelo Álvarez vs. Julio César Chávez, Jr.,” concerts with artists like Michael Bublé, Rush and Mötley Crüe, the yearlong TCM Big Screen Classics film series, inspirational events such as To Joey With Love and Facing Darkness, and anime titles such as Princess Mononoke and Spirited Away. Fathom Events takes audiences behind the scenes and offers unique extras including audience Q&As, backstage footage and interviews with cast and crew, creating the ultimate VIP experience. Fathom Events’ live digital broadcast network (“DBN”) is the largest cinema broadcast network in North America, bringing live and pre-recorded events to 897 locations and 1,387 screens in 181 DMAs. For more information, visit www.fathomevents.com.